What are you doing there, are you on dx-pedition, holiday or on business? Thats what Im often asked. Neither this nor that, Im just at my second home. 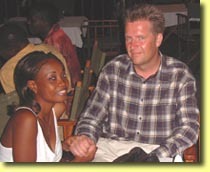 My tanzanian wife Zawadi and our little boy Malique are living in Dar es Salaam...and more and more me too. By the way, Malique is probably the most enthusiastic local "operator" in Tanzania. Only that I dont like his bad habit of entering pile ups with "echo echo", but not the complete callsign...Hi. Or he did just forget the rest, when copying daddy? May be the picture above is indeed the start of a hamcareer, who knows. Mine began similarly. Dad was a ham (Y51XE) and so I came into contact with the radio. With 17 years I was lucky to pass the licence exams with the first attempt and Y51UE went on air. Some active cw-enthusiasts (Tina Y21BE; Egon Y51WE; Fred Y24IF and my dad) were at our club in Strausberg and so I started cw-only as well. Later then I was working also in fone. But I was always checking the log, before leaving the club, if at least I did more cw- then ssb-QSOs. Anyway, still I got some funny comments from time to time: "Dont you know cw, Mike?" We have had a nice time at the club in Strausberg, and it has been a great school for me. DX and Contesting on HF has been my playground at this time, and it is still. Before and after school I was at the club, probably had my most active time ever. Over the years the QSL cards have been changing, going along with changes in life. When the school days ended, and so my time at the club there in Strausberg, I had to join a very special kind of a DX-pedition: Military service. Fortunately I served as a full time cw-operator and could even improve my skills that way. Some of the guys, I was having "QSOs" with them in the army networks, are still active high speed-cw hams. Needless to talk about the incidents in Germany, that let us say "Bye!" to our Y2-callsigns. Unfortunately with the new DL-calls we lost some speciality while DXing and Contesting. Anyway, the 90th were also marked by spending much time for family and job. Thus I was not very active for a couple of years. Actually the fever came back in 2004. Zawadi was in the office all the day, when I discovered the 5I3A-club, while exploring Dar. I was welcomed there at the Institute of Technology, but not really well prepared: A mostly cw-op without a keyer? I was only having a notebook with me and had to build a simple interface first. Soon I got my licence and did start enjoying the pile ups. Using CT, running a pile up without keyer was not a problem. But often I thought to myself: "Guys, dont ask me questions! You dont know, how I am missing my keyer!..." And what will be next? Well, in Africa it is not common, to plan more then the next three days...Hi.